WIN the ULTIMATE VIP PACKAGE at Nickel City Con! Every day of the con we are giving away One Ultimate VIP Package to one of the first 500 people through the doors. Get to the con early and you’ll have a chance to win our Ultimate VIP Package which includes an autograph 8×10 photo & a photo op with every celebrity on-site that day. You will also get VIP seating for ALL celebrity panels that day as well as a VIP Swag bag & our awesome NCC Variant comic. Doors open at 3:00pm on Friday and 10:00am on Saturday & Sunday! 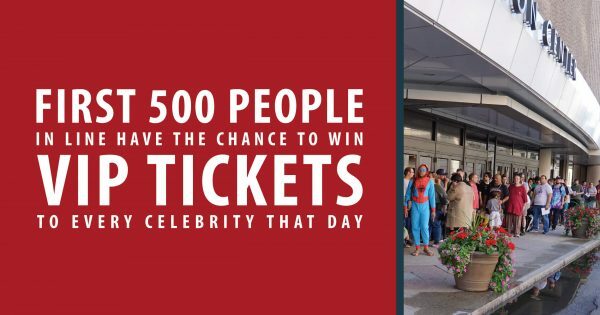 So clear your schedule and make sure you arrive early – only the first 500 people through the doors each day are entered in that days raffle! I cant wait for this! This will be my husbands and i first time going!